Pick Axe Head Manufactured form forged steel and is designed for breaking up hard ground, such..
English Cross Clay Mattock Head This mattock is simliar to a pick axe head, designed for break..
Grubbing Mattock Head Manufactured from forged steel and is designed for cutting out tree ..
Hardwood pick handle 36" (900mm) Eye size (3" x 2") ..
A pick axe is a hand tool with a hard head attached perpendicular to the handle. The pointed edge is most often used to break up rocky surfaces or other hard surfaces such as concrete or hardened dried earth. 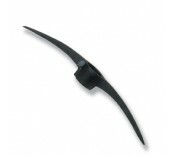 The large momentum of a heavy pick axe on a small contact area makes it very effective for this purpose. • The head of our English cross clay mattocks combine a pick and an adze. It is one of the best tools for grubbing in hard soils and rocky terrain. The adze of this mattock is useful for digging or hoeing, especially in hard soil. • The head of the grubbing mattock combines an axe with an adze. It has two flat blades facing away from each other, with one rotated 90° relative to the other. The blades are generally used for cutting through roots. These mattocks are useful for removing secure objects from the ground. The hardwood pick axe handles we stock fit into the oval eye in the head, and are secured by striking the head end of the handle against a solid surface, such as a tree stump, a rock or firm ground. A similar action, while holding the head, allows the handle to be removed.